While there are approximately 3.5 million truck drivers in the United States, some of the semis one may pass on roads each day have a highly dangerous job that the average American did not even know existed. These brave men and women, who are often recruited former military veterans of foreign wars, are part of an elite, covert group responsible for transporting nuclear weapons across the nation. This very important, and, for the most part secret, trucking job is only one of the many divisions of the National Nuclear Security Administration (NNSA), which is a division of the Department of Energy. Through using nuclear science in a way that pertains to the military, the prime objective of the NNSA is to enhance the available security of the United States. 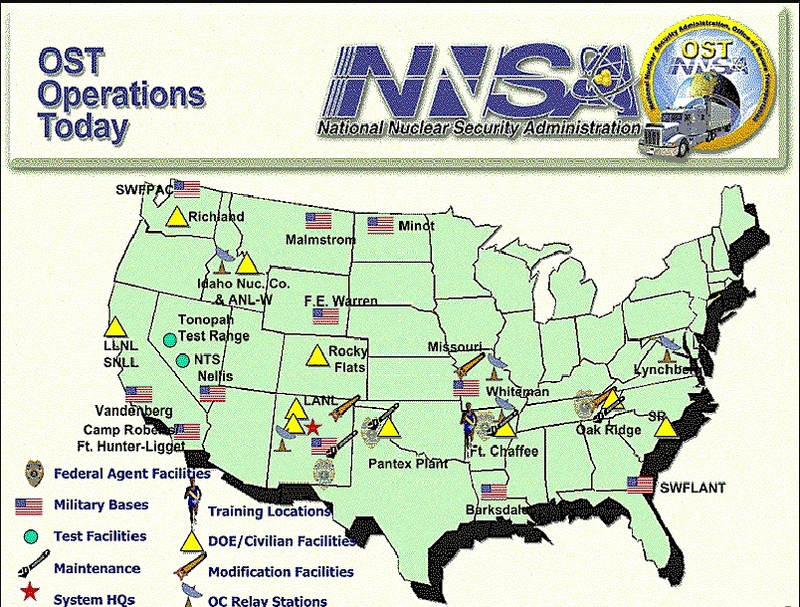 While this may seem it has very little to do with one’s truck driving job overall, within the NNSA, the Office of Secure Transportation ensures the safe travel of these nuclear objects within the borders of the nation. To be transported by the Office of Secure Transportation, the object being hauled must include, “...nuclear weapons or components, enriched uranium, or plutonium.” This transportation aspect of the job itself seems dangerous enough, but the trailers in which these devices are moved are not the typical trailer and are instead highly modified to fit the specific needs of the cargo. To add to the secure delivery of nuclear items, Federal Agents, who are in separate vehicles, drive near the truck while also providing national incident command system response in the chance of an emergency. While it has had a few name and policy changes, the OST has covered over 140 million miles across the nation while carrying items owned by the Department of Energy. It is also to interesting to note that within those 47 years of operation, there have been no accidents ending with fatalities while also not releasing any radioactive material from the cargo. In order to operate in such a low-profile manner while also ensuring safety, the trucks are indistinguishable compared to other semis on the road. To further increase safety measures, the OST introduced restrictions which do not allow a driver to travel during any sort of weather which may harm the cargo. This is regulated by conducting weather checks every two hours during drive time and if the possibility of inclement weather is around, the driver is notified of enclosed shelters which have been decided upon previously. Another interesting aspect of the OST is the fact that a central communications system in New Mexico called the Transportation and Emergency Control Center (TECC) has around-the-clock monitoring and communication which each of these drivers and 42 semis while in operation. The Department of Energy has also established a directory of national and state response teams in case an emergency may rise. As many sources have mentioned, this particular type of transportation is becoming an even more illustrious truck driving job as the United States is set to increase their spending of nuclear weapons by $1 trillion during the next 30 years. Most of this large sum of money, even if set to be spent over three decades, will be used for modernize the current arsenal by improving warheads and also the delivery system. According to the Arms Control Association, in 2015, the Department of Defense and Energy requested $23 billion to upgrade and maintain their existing Intercontinental Ballistic Missiles (ICBMs), Submarine Launched Ballistic Missiles (SLBMs), Strategic Bombers, and also tactical nuclear weapons. Along with that, the Congressional Budget Office gave an estimate of $348 billion for the cost of nuclear forces between 2015 and 2024. Other estimates from three different professionals are responsible for the projected improvement estimates to cost $1 trillion. The Pentagon has also weighed in on this increasingly important budget issue stating that with the need and desire to keep the current nuclear arsenal in top running condition while the new projects that are built will take the current three percent of the DoD's budget used for such projects to an increased seven percent of the overall budget. Many officials from the White House and Pentagon have started to become worried with these proposed increases in spending due to the fact that it may not be possible without a spending increase coming to all levels of military spending within the next 15 to 20 years. 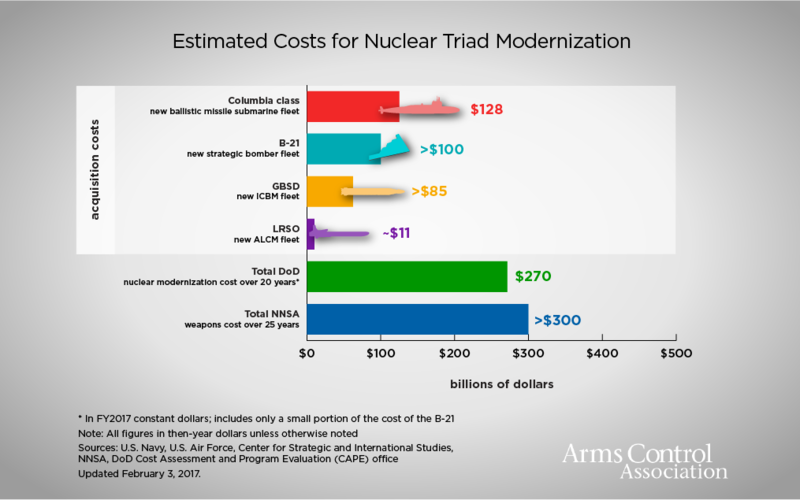 Much of this concern is caused by the fact that the cost of nuclear is set to increase alongside an overlap with “conventional” weapon modernization. While there are obviously many different estimates out there, it becomes obvious that whichever agency provided a correct or even a close estimate, the United States will be spending quite a lot on nuclear activity within the next 20 or 30 years. With this increase in the nuclear arsenal, many officials within the affected agencies and sectors are expressing growing concern that the added movement of cargo may place more strain on the drivers. Some of the problems mentioned within the OTS already are those of being forced to drive more than legally allotted, not being able to find high quality drivers who will remain dedicated to their position, and trucks that are not up to standard for transport. The main conclusion these smaller concerns add up to is that of a heightened risk of terrorism. According to one official closely tied with the Department of Energy, in transporting anything that deals with nuclear activity, the worst must be assumed first in order to better prevent any mishaps. Other problems the agency faces is an overall issue of lack of staffing. Ideally, the OTS would have at least 370 drivers, but currently only have 322 due to budget cuts which also resulted in cutting training classes for drivers. As is a common issue within the industry, most of these drivers are also forced into overtime, another result due to their lack of drivers – this has resulted to over 100 of the currently employed drivers putting in 900 hours of overtime. Though some of the problems have arisen more recently, other problems have been apparent for more than five years. In a 2010 inspection conducted by the Department of Energy's inspector general, it was discovered that in only three years, 16 incidents were caused by alcohol, including arrests made and the OTS's top agent being charged for drunk driving at twice the legal limit in 2009. As most of the trucking industry is discovering new and more fuel efficient ways to deliver goods, the OTS continues to operate with trailers that are over 15 years old – a blatant violation of the Department of Energy's own standards. Another huge problem drivers face is the rate of pay. One veteran was even quoted saying that the rate of pay he received for these dangerous missions equivocate to less than what he received while serving in the Marines. Clearly, the pay rates for drivers differ and only certain reports can be truly accountable for the truth, but much like other facets of the trucking industry, proper pay for individuals must be taken into consideration lest it become a larger issues within this highly specialized sector of transportation. Though it was mentioned earlier the OTS fleet has never lost or damaged nuclear cargo, the trucks have been involved in accidents. Also mentioned was their high attention to maintaining security, but it was reported in 2014 that a person employed by the agency, but not authorized to come into contact with the cargo was somehow granted access to one of the weapons during transportation. While the individual was removed from the mission, it is a cause for concern. It has also been stated by those who supervise Congress that the amount of security within the OTS is not at the same standards at which it used to be, even going so far as to calling it the “Achilles' heel” of security. This incredibly particular trucker job is responsible for the safe travel of separate parts to be assembled to transporting completed nuclear weapons across the nation in order to make sure that if there were an attack on a holding site, not all of them would be destroyed at one time. Though recruits are trained for 21 months at Fort Chaffee, Arkansas, if something is not done to increase morale and decrease the turnover rate, the Office of Secure Transportation could face further problems, even as the budget and production of nuclear weapons increases in the coming years.